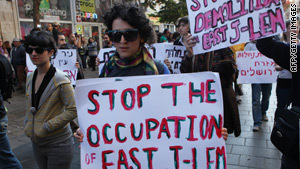 Israeli left wing activists hold placards during a rally in downtown Jerusalem. JERUSALEM (CNN) -- The Israeli government reacted strongly Tuesday to a report that the European Union is planning on officially calling for the division of Jerusalem between Palestinians and Israelis. In a tersely worded statement the Israeli Foreign Ministry warned, "There is nothing new in the European position, but the process being led by Sweden damages the EU's capability of being a significant player in the mediations between Israel and the Palestinians." The Israeli daily newspaper Haaretz reported Tuesday that European Union foreign ministers could make the announcement calling for the division of Jerusalem next week. The newspaper said it obtained a draft document authored by the current holder of the EU presidency, Sweden, that stated the EU Council "has never recognized the annexation of East Jerusalem. If there is to be a genuine peace, a way must be found to resolve the status of Jerusalem as capital of two states. The Council calls for the reopening of Palestinian institutions in Jerusalem in accordance with the road map. It also calls on the Israeli government to cease all discriminatory treatment of Palestinians in East Jerusalem." The Road Map cited in the statement is a peace plan proposed by the Middle East Quartet -- the United States, the European Union, Russia and the United Nations. The newspaper also reports the document says the EU will accept no changes to the 1967 borders of a future Palestinian state unless approved by the Palestinian Authority. The Israeli Foreign Ministry also asserted, "Following significant steps taken by the Israeli government to allow for the renewal of talks between Israel and the Palestinians, Europe must put pressure on the Palestinians to return to the negotiating table. Moves such as the one spearheaded by Sweden have an opposite effect." Israeli Prime Minister Benjamin Netanyahu has been pushing for a resumption of talks following his decision to order a 10-month freeze in settlement construction on the West Bank. That decision, which has set off confrontations with Israel's volatile settler movement, does not include Jerusalem. But Netanyahu has urged the Palestinians to take advantage of the "window" created by the freeze to resume negotiations. An explicit call from the European Union to divide the city for the creation of a capital for a future Palestinian state would represent a departure from previous EU policy which has called for the two sides to share the city based on mutual agreement and would also be seen as a victory by Palestinian officials who in recent weeks have called for a United Nations vote to recognize a Palestinian state. The press office for the European Union would not comment publicly on any announcements or deliberations by member states. Israeli and Palestinians both claim East Jerusalem as their own and tensions over the area have boiled over in recent weeks with Palestinians and Israeli security forces clashing on numerous occasions. Israel seized East Jerusalem in the 1967 war with its Arab neighbors and annexed it as part of its sovereign capital; a move not recognized by the international community. Yigal Palmor, a spokesman for the Israeli Foreign Ministry told CNN the Israeli government believes any statements from the European Union that explicitly recognize a Palestinian claim to East Jerusalem must be accompanied by a parallel statement recognizing the Jewish state's claim to West Jerusalem. Not to do so, he said, would throw the efforts to resume negotiations with Palestinians into "uncertainty and limbo." The language of the Israeli government statement underscores a frustration with Sweden over what officials in Jerusalem see as an increasingly anti-Israel stance from the Scandinavian country. Israeli government officials who wished to remain anonymous, citing the sensitivity of the issue, said since Sweden had assumed the EU presidency no outreach or consultation with Israel had taken place and from their actions it looked like "they are plotting" against Israel as it relates to restarting negotiations with the Palestinians. Relations between Sweden and Israel reached a low point over the summer after a bitter row over a Swedish newspaper report that accused Israeli soldiers of killing Palestinians in order to sell their organs. The report elicited a furious reaction from the Israeli government which called on Sweden to publicly denounce the article, a move the Swedish government refused to do citing freedom of the press.